Q. I need to find articles from a specific journal. 1) If you know the title of the journal you need articles from, go to www.nvcc.edu/library, select the tab titled Articles, and then click on Find Journal by Title. 2) Type the Title of the journal in the search box surrounded by quotation marks. Make sure that you are spelling the title of the journal correctly. 3) In the search results you will see a list of journals. Click on the title of the journal in order to be taken to a page with more information about the journal and the library's access to that journal. 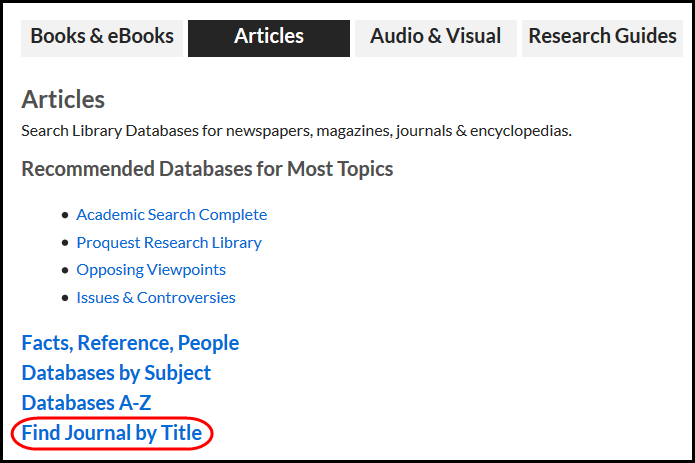 4) You will see a listing of databases in which the journal is available including the date range in which it is available in full text in that database. Click on the linked name of the Database in which you would like to view the journal in order to access the contents of that journal online. Please note that you may need to log in using your Blackboard username and password when off-campus. Contact a librarian if you need any additional help.